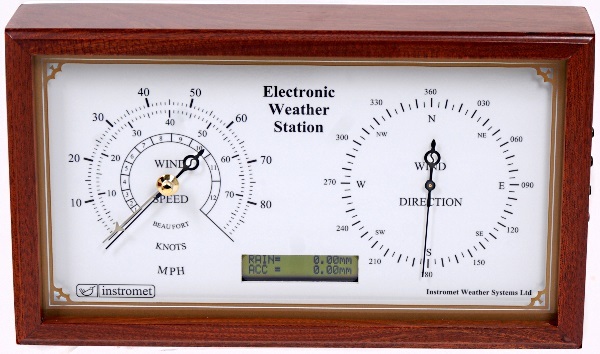 NB This page assumes that you have already read our introduction to the Instromet range of weather stations and provides more detail on sensor and configuration options for the Atmos station. Special Offer – Christmas 2016: A FREE rain gauge will be supplied with compatible Instromet stations ordered Nov/Dec 2016. The Atmos is the entry-level model in the Instromet range. 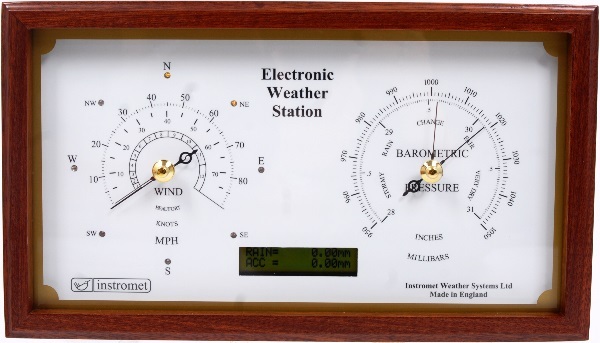 Atmos provides an excellent introduction to the Instromet stations and is ideal for users wanting an impressive dial display of wind and/or pressure data plus, optionally, temperature and rainfall data presented on an LCD panel. Please note that the Atmos models cannot be connected to a PC or website and that the humidity and sunshine hours sensors are not compatible with the Atmos display. If you need a PC connection or humidity/sun sensors then please look at the Climatica range. In the Atmos station, anemometer and optional temperature sensor & rainfall gauge are cabled to the Atmos control box and then a multi-core cable leads on to the Atmos display. Sensor details, including specifications, for the anemometer and rainfall gauge will be found on the Instromet sensors page. Sensor leads to the control box are the usual 25m length, which can be extended if necessary. The control box is a closed box, but one which is not formally weather-proof and so is best located indoors in a dry area. Power to the complete Atmos system is supplied via a 12v mains adapter that plugs into the control box (so the sensors and display both have their power supplied from the control box). The cable from control box to display is a 5m multi-core cable, which can be extended in principle, so the display can be located some way away from the control box and does not need its own power supply. There are four distinct models in the Atmos range, according to which weather parameters the unit is designed to display. All Atmos models have two large analogue dials set within a glass-fronted, polished Sapele wood case 310mm long, 176mm high and 61mm deep (or about 12 x 7 x 2.5 in inches), so the display itself is a large, impressive and highly visible unit that can be clearly seen from across a room. The MWD fitted to the Atmos T stations has the ability to display Temperature (C/F switchable with Min/Max function), Rainfall (mm/in selectable, and accumulated amount), and also time and date for reference. There are four buttons that control the MWD display on the right-hand side of the case of Atmos stations fitted with MWD (just visible in the NT display image above). Note that the MWD cannot be fitted retrospectively so if it’s at all likely that you may wish to see temperature and rainfall data then it would be prudent to pay the small extra initial cost for the ‘T’ models and not be locked out of future upgrades to the temp/rainfall sensors. The standard wind speed display shows MPH on the outer scale with knots and Beaufort on inner scales. Wind speed calibrated in kph or m/s is available to special order. The display cabinet will sit on any suitable surface or can be wall-mounted with two large-head screws at 220mm centres. Remember that power for the display is supplied direct from the control box and so there’s just one single cable feeding into the display from the control box, with no need to locate the display near to a mains socket. 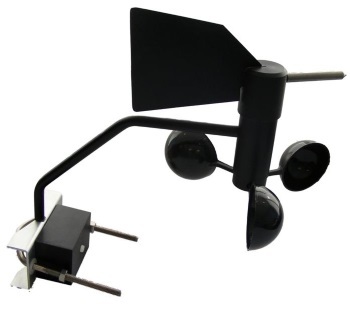 The anemometer is supplied with bracket for attaching to a suitable mounting pole (25-50mm OD), but the pole itself is not included. Mounting kits with a 1m or 2m pole are available as an optional extra. Full pricing details can be found on our downloadable Instromet price-list. Please note that all Instromet stations are made to order in the UK following receipt of a firm order. Despatch is typically 10-14 working days from ordering. Please contact us to place an order. Both of these sensors are detailed on the Instromet sensors page.